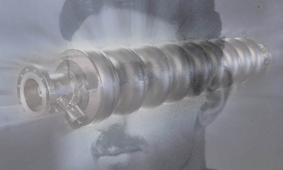 Here is some news about latest developments in Tesla movies: http://www.facebook.com/pages/Fragments-From-Olympus-The-Vision-of-Nikola-Tesla/181802521854082 with trailers @YouTube et al. I can’t ignore the feeling that this film (“Tower to The People”) will tell the story of Tesla’s vision of wireless transmission of energy, and the utterly uninteresting Tesla FBI case, again. To transpose Tesla’s magnificent, century-old vision into today’s world would have been a greater challenge to meet. Another film is in the pipeline, too: “Tesla- Ruler of the World”, produced by Vladimir Rajcic, with Nicolas Cage as Edison and, of course, Christian Bale as Tesla. One can only hope for the best. Matthew Inman’s bestselling book “How to Tell If Your Cat Is Plotting to Kill You” is available in Germany now. Maybe Mr. Inman’s spirit will spark up both film productions. Cross fingers. The photography shows the superconducting high-frequency TESLA cavity that will be used for the new world-class linear collider, developed at DESY, Hamburg, with some Tesla in the background.